Growing a stand of pine trees to economic maturity can take anywhere from 30 to 50 years, which makes timber growth for profit a long-term investment. One way that plantation managers are maximizing their investment in timber is by thinning their stands. The purpose of thinning is to increase growing space and reduce competition for nutrients, sunlight, and water among the pines in a stand. Through periodic removal of some trees, plantation managers can take steps to ensure a final harvest of large, profitable pines. Also, thinning allows landowners to see a faster economic return, as they can sell the first and second cut trees for pulp to be made into paper or turned into wood pellets for use as biofuel. The process of removing trees by row, called row thinning, is one of the most common methods for thinning stands of pines. Popular for its practicality, row thinning entails removing alternate rows (every third, fourth, or fifth) from the stand. Accounting for its popularity as a practice, row thinning requires less planning than other methods and allows for the use of large equipment as it creates corridors for machinery to operate within. However, because row thinning does not consider the quality of the trees harvested, it doesn’t improve the quality of the stand. Another popular method for thinning is selective thinning. Also called low thinning, this method involves harvesting the smallest and lowest-quality trees before maturity to make more room for the fastest-growing and most well-formed pines. The advantage of selective thinning is that it leaves behind the highest-quality crop of trees. However, low thinning is more labor intensive, as it can be hard to operate large logging equipment in the tight confines created by trees and high-quality trees can damage lesser-quality timber during the harvesting. Combination thinning provides the best of both worlds: high efficiency and careful tree selection. When combination thinning, plantation managers initially create corridors to ease access for harvesting equipment. Following the establishment of corridors, pines are selectively thinned based on the well-being and future value of the tree. For both landowners and loggers, the end goal of thinning pine stands is to maximize the value of the timber found in them by creating the optimal environment for forest growth. While thinning will help grow larger, healthier, and ultimately more valuable trees by eliminating competition over critical resources, soil health is equally important, as stands with good soil allow trees to more readily absorb water and nutrients. In the end, thinning facilitates quicker recovery, faster growth, and higher profits. Tires like the Primex LogStomper Super High Flotation are designed to meet the needs of today’s logger. 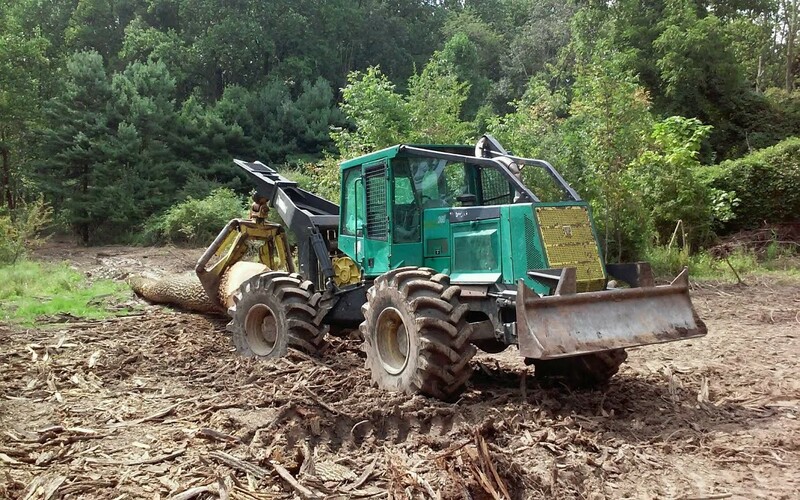 Built tough enough to handle the forest’s biggest jobs and harshest terrain, the LogStomper Super High Flotation is also capable of helping harvesters and skidders operate in the confined conditions found in pine stands and plantations. More importantly, they are engineered to minimize the impact this massive machinery has on delicate forest soils, keeping your pine happy, healthy, and profitable. Contact your Alliance Tire Group dealer today to learn more about the Primex LogStomper Super High Flotation and all of our other fantastic forestry tires!